I'm Not Obsessive, I'm Complusive ... Or Is It The Other Way Around? See, we all likely, at some level have OCD. With the New Year, comes New Year resolutions. Getting organized is moving up the #3 on the list of things many people want to accomplish in the coming year. January is National Get Organized Month (GO Month), and professional organizers will be hosting free events around the country. 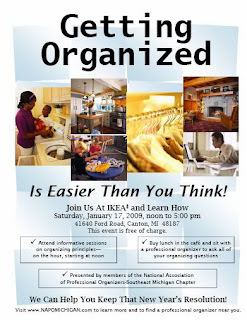 For southeast Michigan and northwest Ohio, your opportunity to meet with professional organizers will be Saturday, January 17th at IKEA in Canton, Michigan. If you've thought about chatting with a professional organizer, this will be a great opportunity for you to meet and chat with one of us. You should be pulling out your calendar now and making a note to attend. Hey, you'll get to meet me (the chick behind this blog) and other great people who want you to love your space. What do you want to get organized? We're kinda breaking tradition this year. For the past 8 years, my boys and I have always made our Christmas cards. It started as a little activity to keep them entertained. I cut out different shapes, supplied the glue and music, they went to town. Each of the up to 50 cards sent out were unique for the first 6 years. (yes, looking back I was insane) Then I became wise and had the boys decorate one card cover to use for our Christmas cards. This year I am doing what most great artist do - "A Best Of ..."
Here is our 2008 Christmas card. I'm not going to be mailing any cards this year. Just not going to happen. I know my limits and it's just not going to work this year. Feel free to print it out and enjoy. Matthew, Jacob and I wish you all the best this holiday season. What's on your 'Best of' collection? Grandmothers are wonderful, sweet, tender loving people. When a family turns to me to help them with their grandmother, I always think about my grandmothers. "Marcella" had downsized from her home to a small apartment a couple years ago, and the time had come for her to move into an assisted living facility. 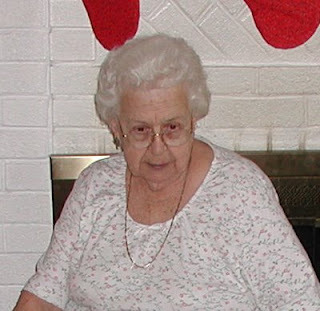 Living alone, lack of socialization and her dementia led the family to this decision. Marcella was quite happy about it. She was getting scared and confused being alone. Her family was worrisome, too. We spent a few hours choosing the best clothes to move to Marcella's new home, consolidating boxes of pictures and letters, and clearing out the kitchen. Marcella was smiling about donating her clothes and other household items. She was even go through items on her own that needed to be tossed. The plan was Marcella to have breakfast with a daughter while we moved her things to her new home and have all her things put away with her favorite nick-knacks in place. On the morning of the move, Marcella was found in her bathtub. She could not get out and had spent about 12 hours alone unable to reach a towel or phone. Cold and disoriented, her granddaughter got her dressed and under the covers of her bed to warm up. Quickly we came up with Plan B: Marcella seemed OK, though we just were not certain. The family ended up taking her to the ER for evaluation. They had me continue to work in Marcella's new home getting all her items put away. Turns out she was a bit dehydrated from not eating and drinking properly. Luckily, the night spent in the tub has not caused any serious problems. After a couple days in the hospital, she is now enjoying her new home. Please take the time at your family gatherings to make sure your older loved ones feel safe and secure in their home. With our children, we speak about scenarios for fire and weather safety drills. Perhaps it is time for your family to discuss the game plan for reacting to a situation with your older family members. Whom in your family may need a plan B? Beautifully appropriate video clip for this holiday season. What 'doghouse' gift have you received? Hey, I just realized my previous post was about husbands, too. Hmmm.....and I don't even have one. Our biggest battle as professional organizers is not stacks of papers, piles of toys, jammed closets with clothing, wall of boxes in the basement or linen closets tumbling with sheets. That's just stuff. After chatting with your professional organizer, you have a sense that the Calvary is on its way. Whether you live in a 500 square foot home or a 5,000 square foot home, you can feel crowded and cramped if you are not using the space properly. One trick to organizing is creating boundaries for yourself. By placing limits on an area, and staying within the space, you will be setting up cues for yourself to maintaining an organized home. Your mail comes in and you pile all the bills, receipts, cards, flyers, catalogs on a table. Go off and make dinner, tuck the kids into bed, clean up the kitchen, get to bed yourself, and wake up the next day to head off to work. Only to come home and place the new day's mail on top of yesterday's mail ... and the snowball begins to grow. Have a small vertical holder on the table. As you bring the mail in, take a moment and sort it. Tossing the junk mail into the trash. Use your new holder as a gage. If you can't get through the mail in one day, that's OK. If a couple days pass and there is no room in your holder, then it is time to take a moment and clear out the papers. The vertical sorter can be substituted for a small box, bin, whatever you wish to use. Just be practical about its size. You don't have to wait until it is filled to do something. The purpose of the sorter or box is to place limits on what is going on in your home. Allowing you to correct a organizing set back, before it gets out of control. This limiting idea is not just for mail. You can use it for books, pens, glue sticks, Matchbox cars, Hanna Montana stuff, receipts or your husband's daily pocket dumping area. Set some boundaries up around your home and use them as cues to get on the organized track. ... and if that doesn't work for the other members in your home, set your phaser to vaporize. What are you about to get organized? ... or are you just going to vaporize it?